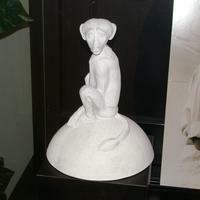 Plaster model of a young baboon sitting on a half sphere. 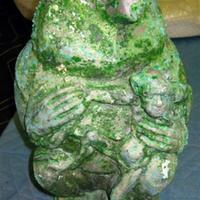 His proper right hand is over his proper left shoulder. 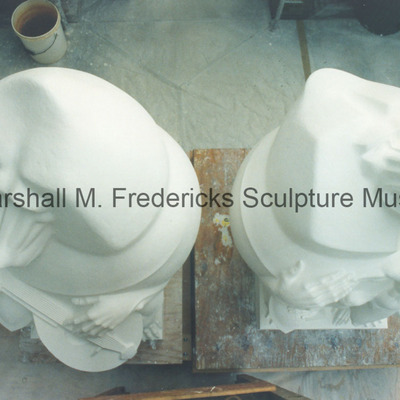 Fredericks signature is on the bottom of the base. 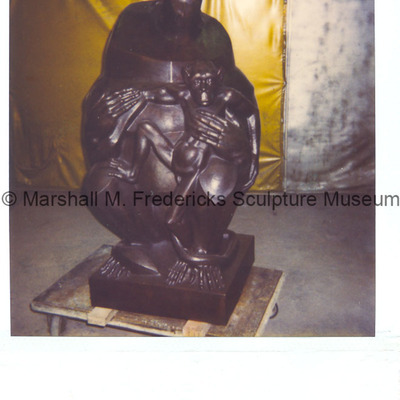 This sculpture was part of the Board of Directors Fountain for the 1939 New York World's Fair. 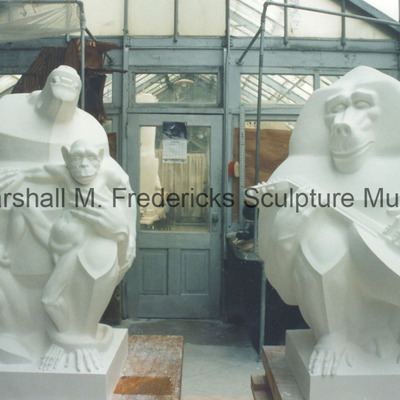 Bronze "Baboon and Baby Chimpanzee"
Plaster models of "Baboon and Baby Chimpanzee" and "Baboon Playing a Mandolin" in Marshall Fredericks' Bloomfield Hills (Greenhouse), Michigan studio. 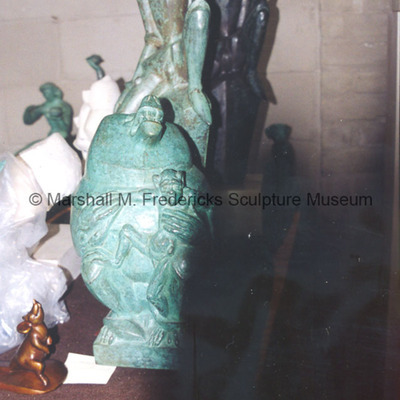 Bronze castings of these two works are in the children's garden, Community House, Birmingham, Michigan. 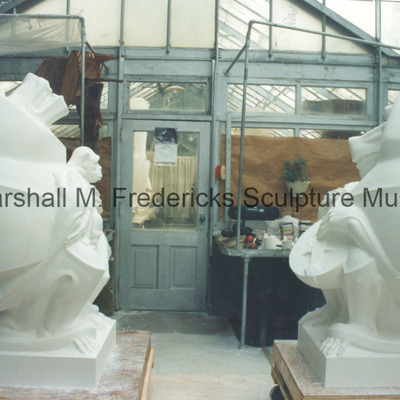 Full-scale plaster model of "Baboon and Baby Chimpanzee" and full-scale model of "Baboon Playing a Mandolin"
Plaster models of "Baboon Playing a Mandolin" and "Baboon and Baby Chimpanzee" in Marshall Fredericks' Bloomfield Hills (Greenhouse), Michigan studio. 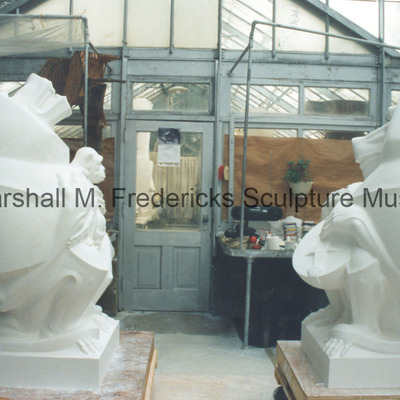 Full-scale plaster model of "Baboon and Baby Chimpanzee" facing full-scale plaster model of "Baboon Playing a Mandolin"
Plaster models of "Baboon and Baby Chimpanzee" and "Baboon Playing a Mandolin" in Marshall Fredericks' Bloomfield Hills (Greenhouse), Michigan studio. 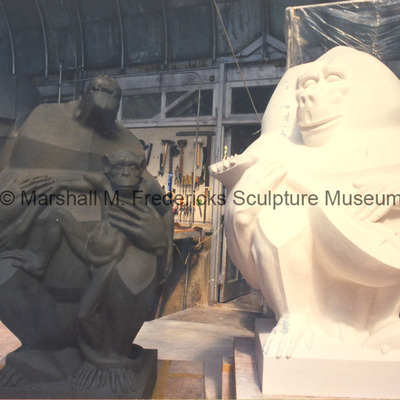 Full-scale plasteline "Baboon and Baby Chimpanzee" and full-scale plaster "Baboon Playing a Mandolin"
Plasteline "Baboon and Baby Chimpanzee" and plaster "Baboon Playing a Mandolin" in Marshall Fredericks' Bloomfield Hills (Greenhouse), Michigan studio.